“Svensk Bonnasynth” basically says it all… this is Swedish Electronic Hillbilly Music! The musicians involved in Adolf Filter, Kord and Monster Apparat have a long tradition in producing electronic music and have been active in the Swedish music world for years. With this record they serve us roots music coming from analogue synths… traditional and conservative elektro and synth music… but effective as it can get! None of the musicians are new to Enfant Terrible. 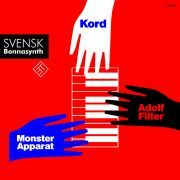 Last year (2010) there was a cassette with Adolf Filter, Kord and Monster Apparat. Produced especially for an Enfant Terrible label night where all three bands performed live. The tape was given away for free to the visitors of the night only. Next to that Adolf Filter was already present on our compilation Festival Der Genialen Dissidenten from 2008 and also released a 7” EP on Enfant Terrible that same year.